After a small hiatus from growing microgreens, I started a couple batches tonight. I planted one teaspoon of arugula seeds in one cup soil and 2/3 cup water. 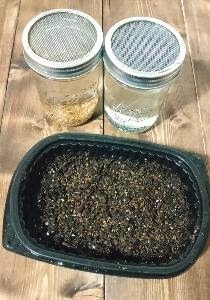 I also started soaking some wheat grass and sunflower seeds to plant tomorrow. I'm reusing old takeout containers for planting trays. They work well and so far have been pretty durable.